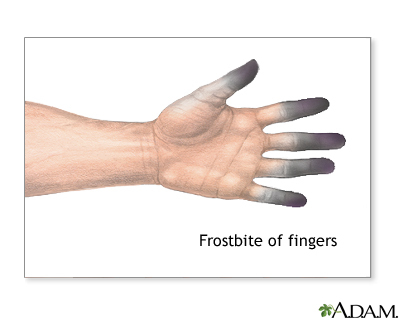 Frostbite occurs when the skin and body tissues are exposed to cold temperature for a prolonged period of time. Hands, feet, noses, and ears are most likely to be affected. If the blood vessels in the frostbite areas are affected, permanent damage can occur. Damage to the blood vessels causes death of the tissue it supplies. Tissue death may necessitate amputation of the affected area.